During the past 11 years in March, the Art Souterrain festival has transformed the cold and commercial buildings of the underground city into an art-filled trail where people come together to explore the unknown. Art Souterrain is an arts organization that launched its’ first exhibit in the winter of 2009. It began as a one night event but then grew to become a full length festival, celebrating contemporary art. The first edition of the festival featured almost as many artworks as you’d expect by their eleventh edition. Aided by a group of art student volunteers, CEO and founder Frédéric Loury was able to bring to life his vision of an artful night. The first show was an experiment. It spanned across Palais des congrès, the World Trade Center, Cité Internationale, Place des Arts, and Complexe Desjardins. Over the years, Place Victoria, 1000 de la Gauchetière, Gare Centrale, Place Bonaventure, and Édifice Jacques-Parizeau, among other places, were added to the list of underground exhibition sites. “Sometimes, you could be less interested because it’s not easy visually, but you just spend 30 seconds and see the object and the artwork and read the label, you’ll change your mind because it’s written for the larger public. It’s not written for specialists,” Loury explained. Most importantly, Art Souterrain’s vision is to make art familiar. Art is not reserved for an elitist group. It should be for everyone. “It’s a long process to change the mind of the people and also, to help the visual arts community,” he said. By establishing a connection between the public, non-profit organizations, galleries and artists, Art Souterrain hopes to make visual arts commonplace in the underground city where thousands walk everyday. “If we could have four, five huge events a year, people would be maybe more comfortable to come, to discuss, to play, to consume artwork,” said Loury. Let’s face it, although most of us enjoy seeing art and learning about it, we don’t really enjoy going to museums, buying a ticket, and walking around from one silent room to another. But what if the very streets you walk every day became the museums and galleries, showcasing artwork along your daily pedestrian path? This year, Art Souterrain is making its mark in Montreal’s cultural landscape for the eleventh time. Since launching, its primary goal has been to expose regular Montrealers to contemporary visual art. And what better way to do that than by creating a pathway through some of Montreal’s busiest and most well known buildings? The festival has grown year after year in Montreal, where visitors follow a trail of artworks and installations in the underground city. The three-week long edition of the multimedia festival presents the trails’ navigation through 54 free activities. For the first time this year, there will be a guided jogging tour hosted in collaboration with a coach. Other days, visitors will have the opportunity to meet the artists or chat with the mediators of the event, who will explain the artworks from different perspectives. Loury said he strives to make the festival more attractive through the events and activities “without an aesthetic proposal,” to present the artwork in the most authentic way possible. 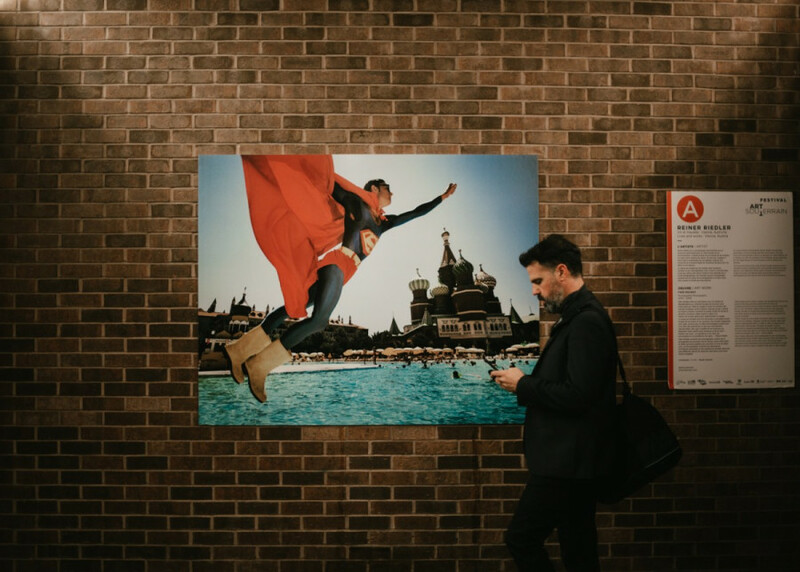 Walking through the underground city, visitors will encounter a black and white short film playing in an open booth at the World Trade Center, a number of photo series along the walls leading to metro stations, art installations, and sculptures. The artworks are seamlessly integrated into the walkways, almost as though they had been there all along. While this makes the exhibit feel like a part of the scenery, it also makes it hard at times to spot the artwork. The downtown-wide exhibition is dispersed through the length of several metro stations, which can be confusing to navigate, especially to those unfamiliar with Montreal’s underground maze. In the festival’s galleries, viewers will not only get to see photography on the walls, they will also get to flip through print media and listen to audio pieces. Loury had a simple goal: he wanted to reach people who were not familiar with art history or contemporary art, instead of making it exclusionary and limited to museum-goers or art-lovers. The organization’s mandate to make art accessible aims to unite the city through creativity. “In these activities you can meet a young migrant or old people who never go to the galleries, or a student,’’ he said. He hopes to create dialogue among Montrealers. Art Souterrain receives municipal, provincial, and federal funds to maintain the organization. Sixty per cent is governmentally funded and the rest is privately funded and sponsored. Loury explained the organization also plans projects to bring “new monnaie” to the festival. For instance, they organize exhibitions in private companies and host an event called “Vitrine sur l’Art” as a means to attracts new faces and push their message forward. “We use vacant stores and we use the window displays to set the artworks and if we’re doing a profit, we put it towards the festival,” he said. While new exhibition locations are added to the festival’s course, Loury said about half of the buildings have remained constant. The biggest difference is the satellite trail—independent locations—like the VAV Gallery, Arsenal, Espacio México, Maison de la Culture Pointe-aux-Trembles, and Ubisoft Space. The most challenging aspect of the planning process is the unpredictability of the buildings’ response to the organization’s, proposal since their approval is never guaranteed. Usually, works need to be adapted to their allocated space. One of the key components to attracting a large audience is the theme. “The first link we are building with the public, it’s the subject. So every year, we are choosing a society subject; last year it was about labour, this year it’s about propaganda, disinformation, fake news,” said Loury. Art Souterrain devotes approximately two years to planning each festival. Choosing the annual theme requires extensive research. “It could be a choice [that] is influenced from the media, lectures, writing, reading, meetings,” Loury explained. After picking the theme, which can take up to six months, a team of three or four curators are invited to participate in the selection process. There are three separate processes for the eventual selection of artworks. Another set of people to pick out the artwork is a team of three researchers, including Loury himself. They begin their hunt by going to art fairs, exhibitions, or even by surfing the web. “It’s a fantastic way to identify artists that I would like to work with, and also I read a lot,” Loury said. His team only kept 40 out of the 150 artists they contacted following their research. This year’s edition features the work of 64 artists–34 from Quebec, 28 international and two from the rest of Canada. This year’s theme pushes artists to question themselves about the sea of information around them, particularly on social media, and stresses the importance of identifying valuable and authentic information. Dominique Pétrin, an artist specializing in screen printing, exhibited her four pieces in Espace Ubi soft. She believes that, in the age of social media, lines between fiction and reality are blurred, making it hard to distinguish one from the other. “My work always plays with what is representation, what is fiction and what is reality. For example, I do alot of fake 3D, trompe l’oeil, mise en abyme,” she said, referring to her colorful and detailed frames which create optical illusions.